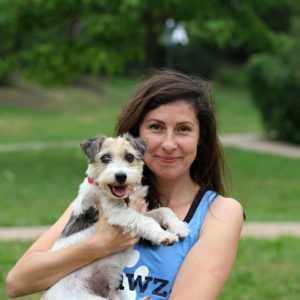 Pawz was founded in 2012 by Martina with the goal to create a company focused on providing top quality pet care with a personal touch for demanding dogs. 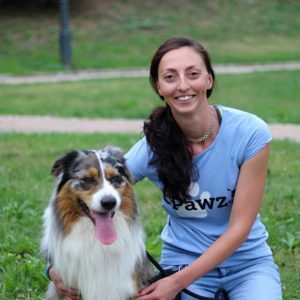 Pawz is the first business in Prague to provide a truly professional one-on-one loving care for your four-legged companions. We offer safe and reliable walking, running, sitting and training services for busy Praguers and are excited about top-notch customer service. We believe in establishing long lasting bonds with both our four-legged, and two-legged clients, so we’re not here to just walk and sit your loved one but become their second-best friend. We know the specifics of dog communication and body language, aggression and how to prevent it, safety and fight protocols, and basic training skills. We don’t walk dogs in packs, we don’t chat on our mobile phones or wear headphones whilst working, and we take our jobs very seriously. As dog owners (who’ve had to search for walkers and/or sitters at one time or another) we understand that the bond between you and your pet is a strong one, and we try our hardest to rid of any stress and anxiety you may have when you are away. Your dog’s safety is always our number one concern. When the other kids were watching MTV, I was taping Animal Cops and the Dog Whisperer. 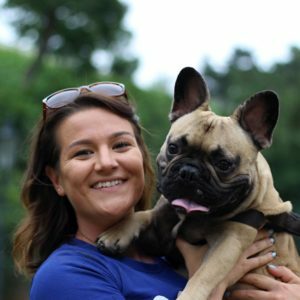 Running off and becoming a cruelty investigations officer for the SPCA soon dissipated—as childhood dreams do—and I went on to work in the media, keeping pooches on the sidelines , whether it was Holland and cleaning up poop in a dog shelter, walking dogs in New York City’s stifling summers or Montreal’s frosty winters. It took me a while to come to the wonderful realization that I can do this fulltime in the very city I love! As a (very proud) owner of the world’s kindest Beagle, I know very well how hard it is to entrust your loving companion in someone else’s care. 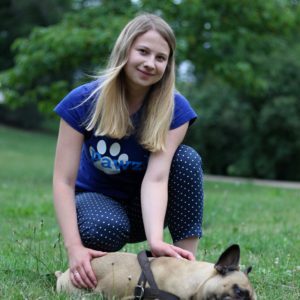 Having cared for all kinds of four-legged personalities well beyond the borders of the Czech Republic, and having learnt from the best in the dog-care field, I’m confident that what I’ve created here at Pawz can make pooches’ and owners’ daily lives a lot more easy going. Since 2014, I’m also a Certified Professional Pet Sitter by Pet Sitters International. 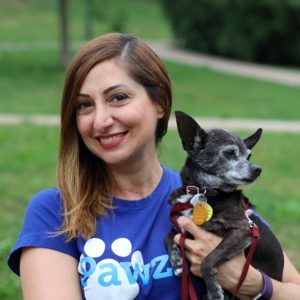 I was a dog walker in the Toronto area for four years before moving to Prague and joining the Pawz team. I have worked with many dogs of many breeds, from Chihuahuas all the way to Newfoundlands and Irish Wolfhounds. My love, compassion and leadership qualities ensure that your dog will be treated with kindness and lots of hugs and kisses! I’ve shared a special bond with animals since very early on, so when the time came for me to decide on what field to go into, my mind was made up. After graduating from veterinary school, I continued my studies at the Czech University of Life Sciences in Prague, specializing in cynology. I’ve worked with animals my whole life, be it as an assistant to veterinarians, volunteer at dog shelters, aide in a dog-training center or a dog sitter in the lovely London. As an owner of two pooches, I’d love to provide the very same care to other four-legged gems. I’ve had a passion for dogs since I was a child, and grew up in London around Boxers, German Shepherds and Great Danes. Finally this year, I got my own French Bulldog! I’ve worked in a dog salon in London, and find working with dogs so much more rewarding than anything else I’ve done. I love caring for dogs and give them the love and attention I would with my own dog. I’m so happy to be working for Pawz and continuing my passion in the city that I love! I grew up in New Delhi but I moved to Prague to study International Relations. Ever since I moved to the Czech Republic, I’ve been asked this question a lot: “Do you miss your family?” and I’ve always instinctively replied with “Yes, I miss my dog a lot.” So, I know all too well to be a doggy parent and to not be able to be with them all the time. I have experience with caring for and fostering lots of dogs, so you can trust me to take care of your fur baby. I really like spending time with dogs and I believe they like spending time with me as well! 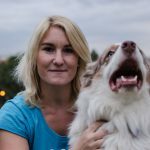 I moved to Prague from Poland to work as a physiotherapist, but by doing so I’ve lost contact with animals and I missed being around them. I have a lot of experience taking care of dogs. As I grew up with three lovely dogs myself — a German Shepherd, a Beagle, and a Pekingese. So I decided to look for ways to have pups back in my life, and found Pawz. 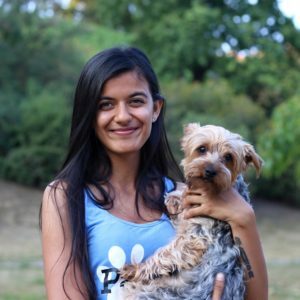 I do enjoy my dog times a lot, and I’m happy to explore the city with my four-legged friends while caring for them. As most children, I dream of having my own dog—a dream that came true two years back when I got my very own Australian Shepherd. We do all kinds of activities together. My yard has turned into an agility field, and if I were not living near Prague, we would probably have sheep roaming around there as well. The new things that my pup teaches me daily are a great source of inspiration to me when I care for your dogs, making their time with me fun and safe. I am a high-energy, sports-loving person, who loves nature, dogs and peace and quiet. The combination of all these is magic. I’ve grown up around German Shepherds, and have really gotten into dog training and sports when I adopted my Rottweiler/Shepherd mix Argyla who came with some baggage we had to intensely work on. Getting to spend time outside with dogs of all personalities is a great way for me to spend my days! I was very lucky to grow up in a household of animal lovers. My siblings and I were spoiled with dogs, cats, and even birds. I played and swam with my brother’s golden retriever as a toddler, and was given my own Springer Spaniel companion at the age of eight. In my college apartment, my study partner was a kitten I rescued. When I moved to Prague over a year ago as an au-pair, I was lucky again to live with a wise old Schnauzer, who I would take care of most when the family went on holidays. 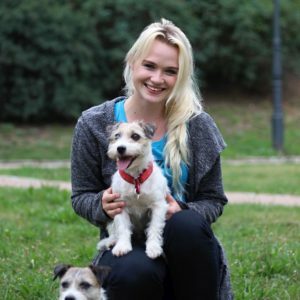 When I decided to live on my own in Prague, I couldn’t help but miss dogs, meeting so many about in this city. Working for Pawz has been such a joy for me because I get to care for furry creatures again, and make new friends! I’ve spent my childhood with German shepherds—my dad‘ favorite breed. 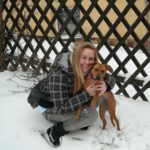 I’ve more deeply connected and became involved with dogs when I moved to Holland and got my first Beagle Max. Attending puppy school and later joining the Beagle Club, I’ve learned a lot over the years about how to work not only with this food-driven, stubborn breed. When Maxik died last year at the age of 16, I realized how much I’d like to continue to work with doggies, and share my love. As a part-time sitter at Pawz, I do my best to provide your pooches with the needed comfort and care when you are not there. As an IT graduate, I ended up with an office job that was draining me. Being outdoors, in nature, was what I missed, and having dogs to share that with was an ideal scenario! The dogs I take care of daily at Pawz have become my close friends, and it’s been so rewarding to see them excited and happy to see you every time as we head out on adventures to Stromovka, Petřín or Hvězda. One of my biggest childhood dreams had been to have my own dog to care for. That dream came true when I turned 11 and got my very own whippet pup, Warinka, who opened up the gates to the dog world, and I gradually became more involved with dog training. 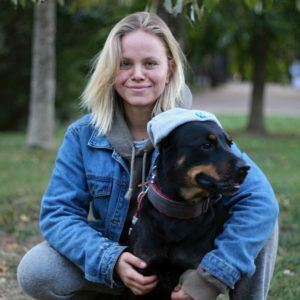 Education-wise, I’ve graduated from the University of Life Sciences in Prague in Animal Science of Special Breeds, and followed up with a Master’s program in Special-interest Breeds. I’ve sucessfully completed instructors‘ training at the Agility Club of the Czech Republic and have attended seminars led by dog trainers such as Gerard O´Shea, Gabi Harris, Jane Killion. 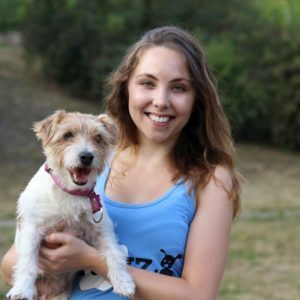 Apart from dog training, I enjoy and compete in agility, flyball, obedience, dogfrisbee and dogdancing both with clients‘ pooches and my own pack of Jack Russell Terriers and an Australian Shepherd. 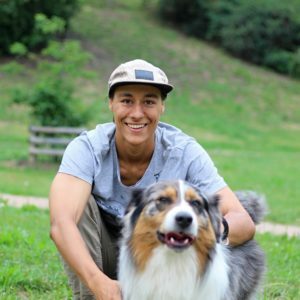 I’m constantly educating myself when it comes to dog training and behaviour modification, and approach each case individually to find the best solution. I come from Bystřice pod Hostýnem, but I live in Prague now. I’ve been trainer for seven years, though I’ve been involved with dogs much longer. My training methods build on positive reinforcement and method called shaping. My greatest teacher has always been my dog named Afy, mixed breed, which I’ve adopted from a dog shelter. Aside from being my best buddy, Afy is my agility partner, and our dream has been European championship and IMCA. Due to Afy’s health issue, we’ve made the MA2 category, and we are currently busy doing canistherapy, mainly with seniors, as well as obedience training. Dog training has been a full-time endeavor for me for some time now. I have experience with everyday problems like pulling on the leash, barking, etc, but my main focus is always on helping owners bond with their dogs.